Try finding your account executive late on a Friday afternoon! Finding direct marketers who know gaming can be a daunting task. Finding those who can deliver great copy, creative and other support is even harder. Forget the Yellow Pages. Sometimes you're stuck with an ad agency on retainer. You talk. They don’t listen. It’s not uncommon, especially if you weren’t consulted on the choice of agency. The reality is you have to work with them. Perhaps you like the design they provide but are tired of rewriting their copy 6 or 7 times. Many agencies use freelancers or staff copywriters who have never even seen the inside of a casino, let alone understand casino marketing and all its subtleties. We'll be happy to write the copy for your agency. Just tell them you want us to do it. You'd be surprised how frequently they acquiesce. Often agencies are relieved to have a copy source with casino savvy. We’ll work with their graphic designers or yours to make sure the process runs flawlessly. Everybody wins! On the other hand, if you're not locked into an agency agreement and want a casino direct marketing firm that will put you first and meet all your deadlines without bankrupting your bottom line call us right now. We're happy to provide copy only or complete turnkey direct marketing services. Since 1990 we've written, designed and produced millions of casino direct mail packages. Work with us and you'll get superior creative and flawless production and execution. Your direct mail will never end up here! We know gaming, we know players and most important of all we'll help you get the right ones back on property. That's a promise. Call (800) LUCKY SLOTS or contact us at: Ad Agency Support to discuss your ad agency situation. If you’d like to work with us… we’ll make it happen! “I wholeheartedly recommend David Kanegis and the Marketing Network. From 1990 through 2000 while I held executive positions at Nevada and regional casinos, I was privileged to hire David and his team to work with me. Days before the Stratosphere opened our Ad Agency let us down. We needed a half million brochures printed and the design wasn't completed. 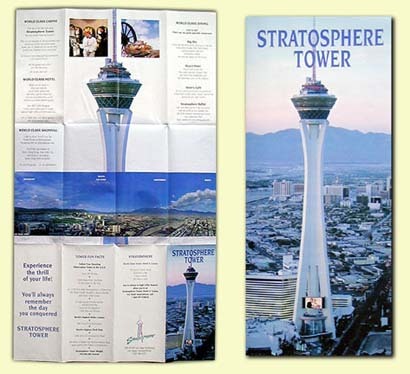 Marketing Network stepped in and designed the Stratosphere Tower Brochure in four hours and twenty four hours later finished artwork was at our printers!"